I’ve joined an “along” that basically is like a photojournal. It’s called the ABC-along (found thanks to Norma), and the idea is that starting in January, you post one photo every two weeks, starting with the letter “A”, and finishing in December with the letter “Z” (that’s a zed, not a zee, BTW!). Gosh, that’s original, isn’t it! It’s me. A is for Amy. I chose this photo because I think I look not-ugly and I love the shawl! Here’s the link for the toe-up pattern (you’ll still need the original one here). Progress can be seen below. These are the unfinished projects I’m taking with me into the new year. I’ve been tagged for my first ever Meme. Now, I had a personal resolution that if tagged I wouldn’t play ball. However, since this is all about the knitting, I’m relenting! What new knitting techniques did you learn this year? Which completed project from the last 12 months are you most proud of? Nothin’ but a T-shirt. I love it. The yarn and the pattern came together in a beautiful way, and the modifications I made worked out great. That, or my Lotus Blossom shawl. What was your biggest knitting disaster of the last year? Turning my Clapotis into a poncho – unflattering and unwearable. It’s now back as a wrap. Who or what has been the biggest influence on your knitting in 2005? Without a doubt, the Ample Knitters list. What knit craze grabbed you this year? Lace, lace and more lace! 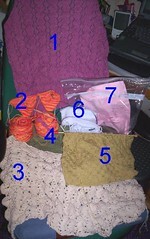 Not that I finished many lace items, but I did start quite a few! Finally, some New Years resolutions. Finally finish that flippin’ Sirdar lace cardigan that I’ve had on the go for about 2 years. I wouldn’t dare inflict this on anyone who doesn’t want it (I’m a wimp), so if you want to be tagged, consider yourself tagged! I love my little nodding dog! I got him last Christmas and I just flick his head every now and then and it really cheers me up. In the background are Sherbet Fountains – man I love them! Right, I’m off to listen to some podcasts and wish my next-door neighbours could have their party elsewhere. Thanks for doing the meme, Amy, and congrats for having your pattern accepted by Magknits. Look forward to seeing it. Happy New Year!! 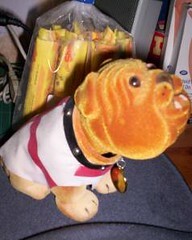 I like the bobble head doggie! I started Jaywalkers, too, but cuff down. So far not so good at the figure 8 toe thing, I think I’ll try the Vogue turkish cast on instead.